Léon Augustin Lhermitte (1844–1925), Les Halles (1895), oil on canvas, dimensions not known, Petit Palais, Paris. Wikimedia Commons. 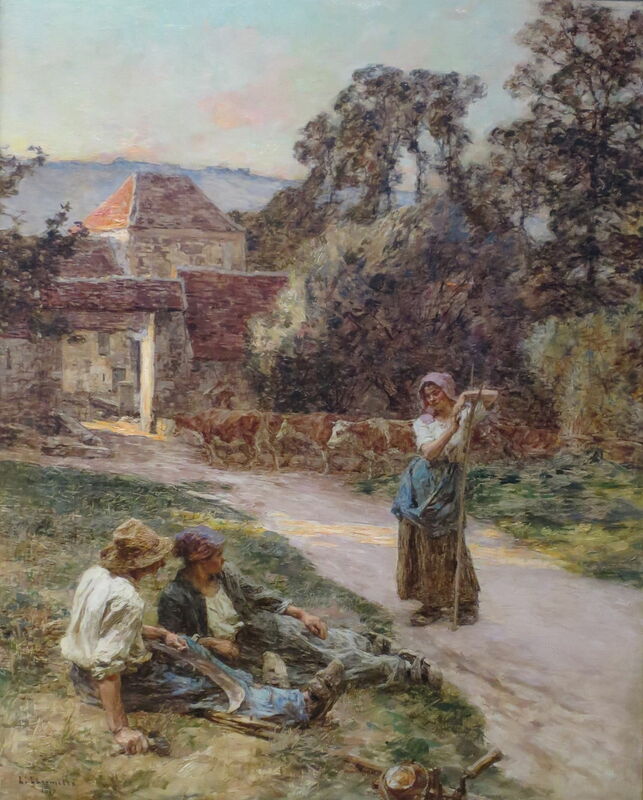 In 1889 and 1890, the Naturalist painter Léon Augustin Lhermitte (1844–1925) had stated on canvas the links between this art movement and contemporary scientific thought. In the later years of his career, he returned to painting more rural themes, but still came up with more original work. Léon Augustin Lhermitte (1844–1925), The Goose Girl of Mézy (1892), oil on canvas, 160 × 85 cm, Private collection. Wikimedia Commons. The Goose Girl of Mézy (1892) follows the paintings of waifs and strays by Jules Bastien-Lepage. 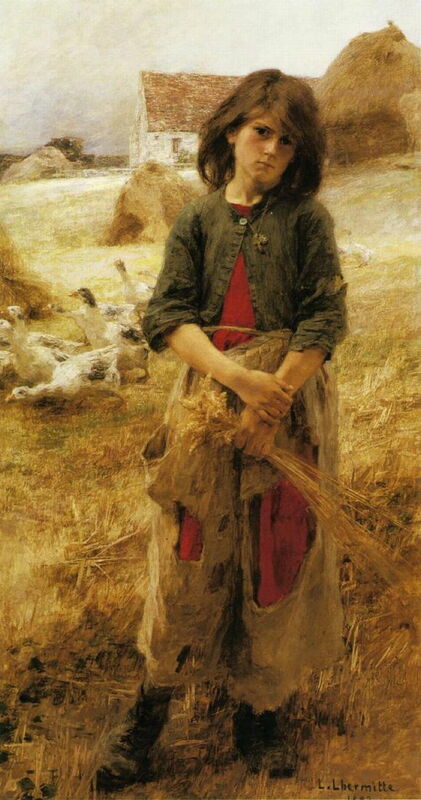 Sullen and sultry, a young girl stands defending her small flock of geese as she gleans for wheat left after the harvest. Her pinafore seems to have been handed down through the generations, and with its gaping holes is a shadow of its former self. 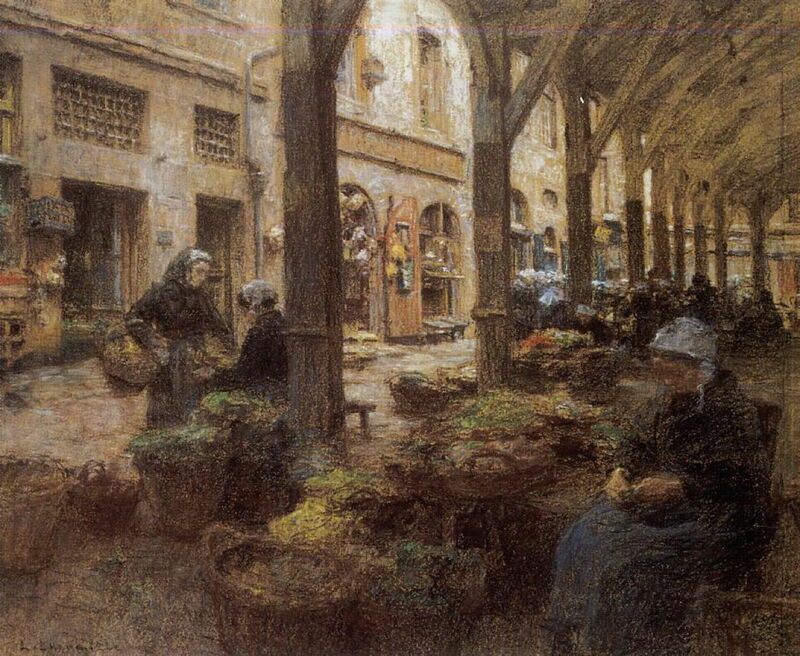 Léon Augustin Lhermitte (1844–1925), Vegetable Market in St-Malo (1893), pastel, dimensions not known, Private collection. Wikimedia Commons. Lhermitte painted in pastels too through his career, and published reproductions of them were greatly appreciated by Vincent van Gogh, among others. This pastel of the Vegetable Market in St-Malo (1893) is a good example of his balance between detail, as seen in the distant crowd and shop fronts, and painterly style. 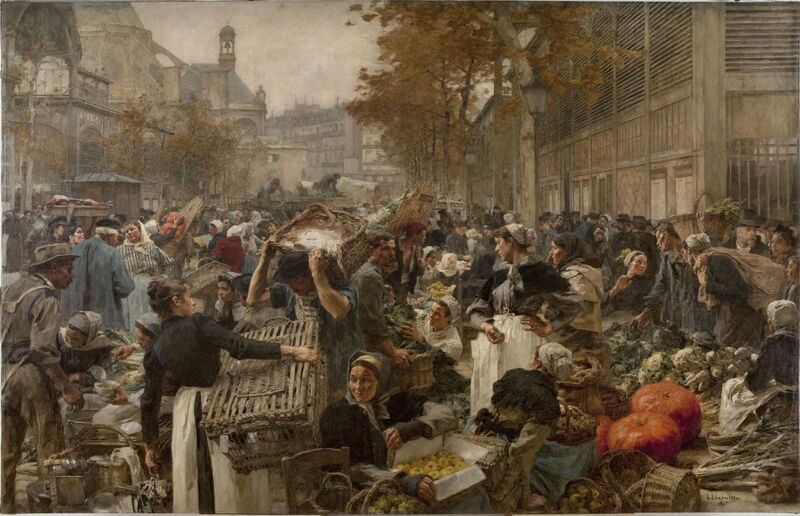 In 1889, Lhermitte was commissioned to paint Les Halles, the main and most central market in the city of Paris. He completed this, perhaps his last major work, in 1895, when it was exhibited at the Salon. The market’s origins were mediaeval, then during the nineteenth century it grew even busier, and was re-housed in iron and glass buildings erected during the 1850s. Lhermitte’s friend Émile Zola set his novel Le Ventre de Paris (1873) in this market. Lhermitte has succeeded here in capturing the crush, rush, and human interaction of the market. His painting is an interconnected web of negotiation, carrying, and conversation, set amidst its relentless human throng. Les Halles was dismantled and replaced with a concrete shopping mall in 1971. Léon Augustin Lhermitte (1844–1925), Sundown: Return of the Cattle (1897), oil on canvas, dimensions not known, Dayton Art Institute, Dayton, OH. Wikimedia Commons. In Sundown: Return of the Cattle (1897), a young woman takes a moment away from bringing her cattle back to the farm at dusk, to chat to a couple who have been working on the harvest. The man holds the broad blade of his scythe on his lap. Léon Augustin Lhermitte (1844–1925), Peasant Woman Resting (1903), media and dimensions not known, Cincinnati Art Museum, Cincinnati, OH. Wikimedia Commons. 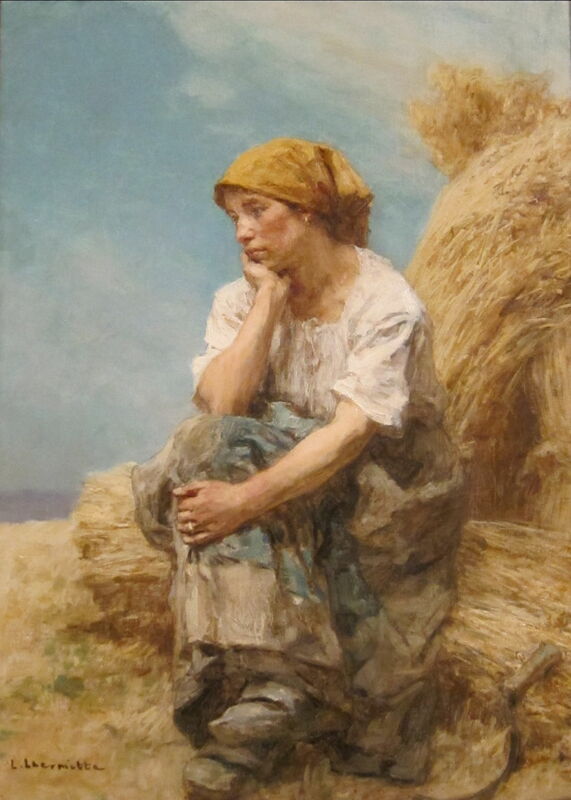 Peasant Woman Resting (1903) is a wonderful and quite loose portrait of a young woman resting from the work of the harvest. A sickle by her feet shows that she is a labourer rather than a gleaner. Léon Augustin Lhermitte (1844–1925), The Family (1908), oil on canvas, dimensions not known, Private collection. Wikimedia Commons. 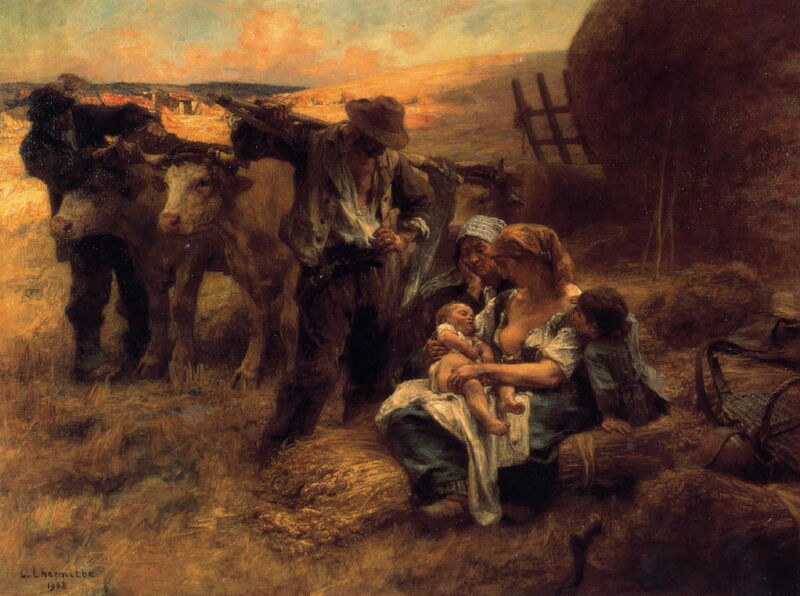 Lhermitte often pictured family groups out in the fields, as in The Family (1908). 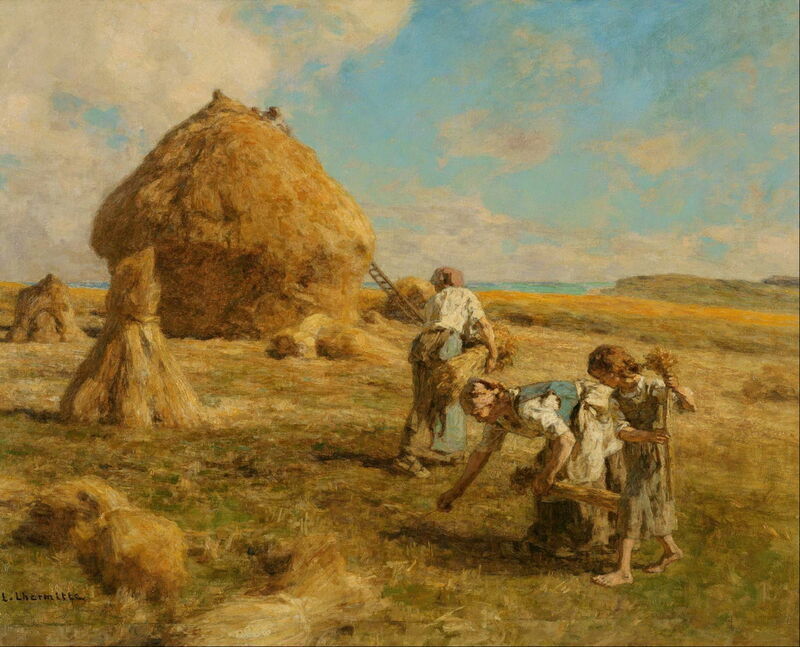 Léon Augustin Lhermitte (1844–1925), Gleaners Near Haystacks (1912), oil on canvas, 89.5 × 128.9 cm, Private collection. Wikimedia Commons. Gleaners Near Haystacks (1912) is another group of women gleaning, after the main harvest has been brought in. 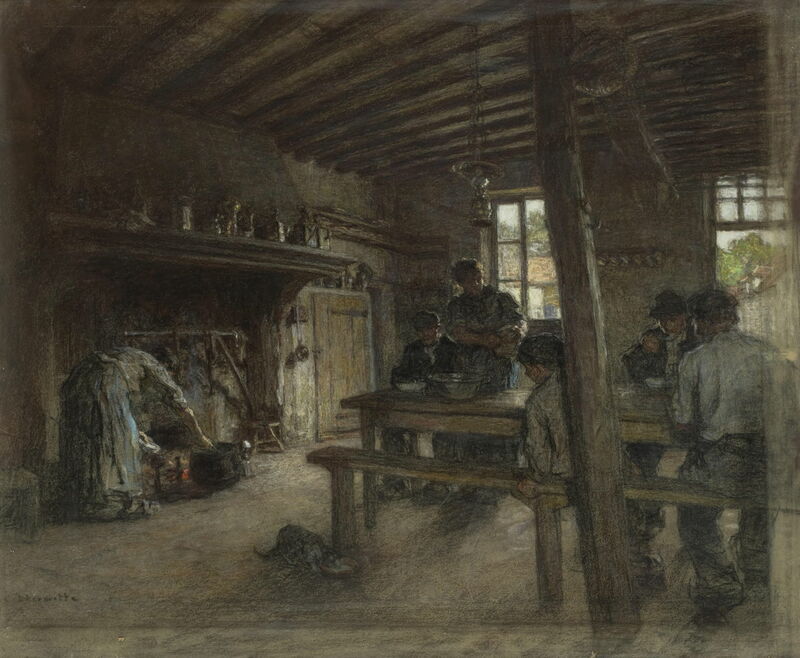 Léon Augustin Lhermitte (1844–1925), The Farmworkers’ Supper (1913), pastel on paper, dimensions and location not known. Wikimedia Commons. He also captured the austere interiors of farms. His pastel of The Farmworkers’ Supper (1913) shows those who have been working outdoors during the long day enjoying a simple and small meal at its end. 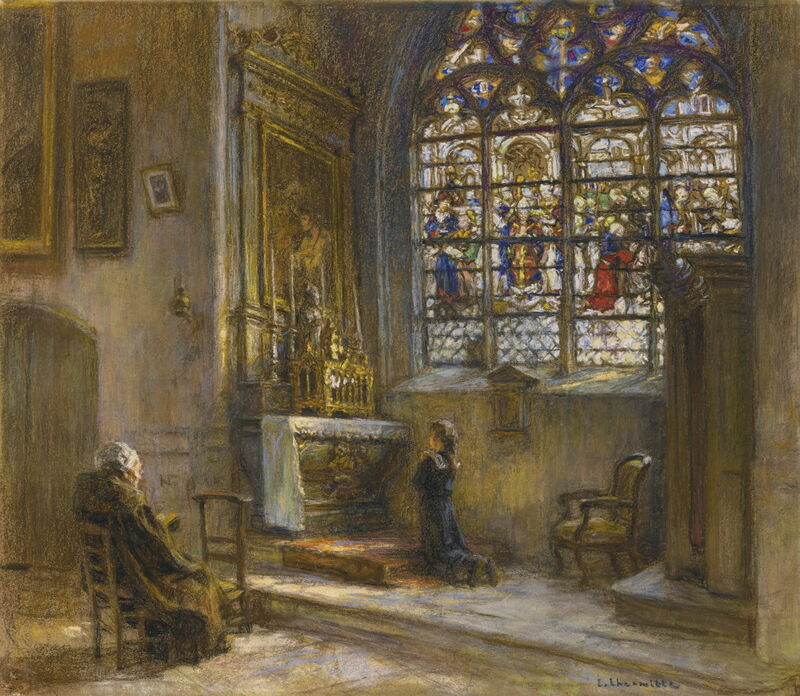 Léon Augustin Lhermitte (1844–1925), The Prayer, the Church of Saint-Bonnet (before 1920), pastel on stretched paper, 49.8 × 57.5 cm, location not known. Wikimedia Commons. Lhermitte had painted a few religious works earlier in his career, but his late pastel of The Prayer, the Church of Saint-Bonnet (before 1920) is probably the most moving. Odilon Redon and other contemporary pastellists had also depicted stained glass windows to great effect. Léon Augustin Lhermitte (1844–1925), Gleaning Women (1920), oil on canvas, 65.4 x 81.2 cm, National Museum of Western Art 国立西洋美術館 (Kokuritsu seiyō bijutsukan), Tokyo, Japan. Wikimedia Commons. 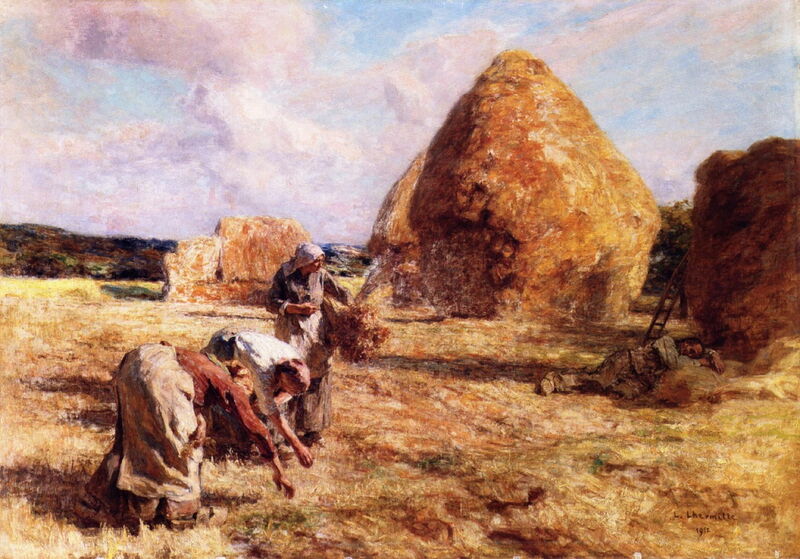 There was always time, though, for just another painting of gleaners, as in his Gleaning Women of 1920. Europe had changed greatly as a result of the First World War. The high toll among the men of the countryside, swollen by those who died during the 1918-19 influenza pandemic, and advancing mechanisation, left few to swing their scythes in the grainfields. Naturalism had also passed, as the art world embraced modernist movements and styles. Lhermitte’s once-popular paintings hung briefly as a memory of the previous century, then were replaced by those of the new generation. Impressionism was still revered, seen as the early stages in the evolution of the new. Naturalism was confused with academicism, and reviled. People forgot how, in its day, it had been the avant garde. Posted in General, Life, Painting and tagged Bastien-Lepage, Lhermitte, naturalism, painting, pastel, realism, van Gogh. Bookmark the permalink.